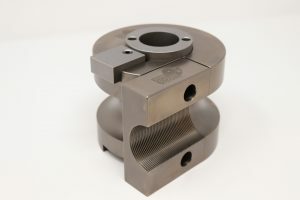 inserted — Occasionally called a “spool die”, this popular design consists of two components: the radius block and the clamp insert. The radius block is notched at the line of tangency and then tapped. The clamp insert is screwed into this notch, which completes the assembly. The advantage of this design is that it is relatively inexpensive to produce, permits replacement of a worn clamp insert, and offers the greatest depth of bend. teardrop — This single-piece design is essentially the same as the inserted design in function. 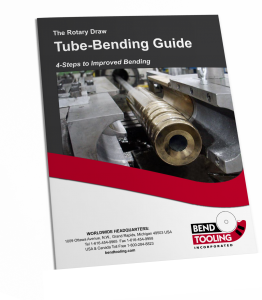 It is more expensive to produce but is necessary when the combination of tube diameter and bend radius create cross-sections too thin in the radius block to permit notching for a clamp insert. platform — This is also a single-piece design that addresses applications too extreme for the teardrop, most commonly when the combination of tube diameter and bend radius create cross-sections too thin in the radius block to accommodate the bending machine’s bend post, pilot, or drive key. The platform design remedies this problem by integrating the teardrop with a bottom plate with a bolt-hole circle, by means of which the bend die is screwed onto the bend head of the machine.